But it isn't going to happen because that is going to cost so much more money to develop and implement than if the user just went out and bout a computer. A calculator is just that: A calculator. What is this TI-OS 5.0 you speak of? TI is never going to produce a calculator that includes a camera. There isn't one. Don't let Ephraim derail this thread. Yes, it certainly sat in my toolbox for long enough; I figured it was time to finally do something with it. I hope you'll consider toying with this with your own camera! Next up, you should make it so the calculator needs to recognize your face to unlock it. That's a great idea; I should make that as a TI-BASIC program. Once again Kerm, you have amazed me! This is a very impressive project. Have you considered trying out a color camera for this? Thank you! I have not: I chose the Gameboy camera because it is cheap, widely-available, and very easy to interface. For the curious, I have pushed a commit to ArTICL containing the current code for this project as a new example. Yes, you can. 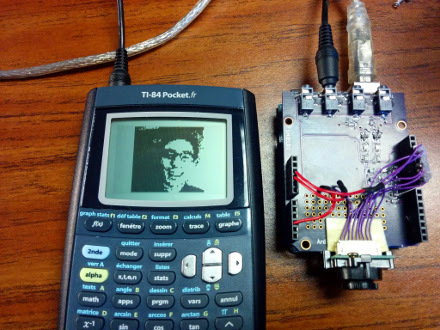 Because it uses native Pic files, you can use TI-Connect or TILP to transfer the pictures to a computer or to other calculators. That's awesome! Is there any chance of the calculator being able to handle it without the arduino? You need at least SOME kind of intermediate hardware. Although the registers are set via I2C, the capture method requires a few GPIO pins, to trigger and clock the transfer. In addition, you need an ADC to convert the analog camera signal strength signal into something useful. Good work as always. 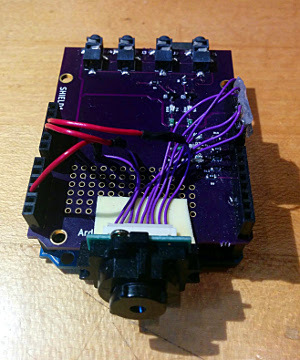 I will attempt something similar once I can get this old CMUCam to work with my Arduino. That would be really cool. Let me know if you need any help with using ArTICL for the project. *bump* I have documented this as the ArTICam project, and I will shortly be posting a news article about it. Oh wow it works last time I was here it didn't yet. Well I'm glad. Only things I wonder are, could it use something cheaper than an arduino, and can it do video? Anyway I'd say it's super impressive, which is an unsurprising thing to say. You can already sort of do video on the monochrome calculators, simply by repeatedly requesting frames from the camera. Unfortunately, even on the monochrome calculators transferring a frame takes 3-5 seconds, and on the TI-84 Plus C Silver Edition, it's more like 10-14 seconds. Therefore, using this system for video is not truly feasible as-is. On the other hand, a 15MHz calculator running an assembly program to fetch a scaled-down, monochrome, 64x64-pixel image from the Arduino (which is only 512 bytes/4 kilobits) could be able to get more than a frame a second of "video". Caleb, any Arduino clone with an Atmega328p would be able to run the firmware for this, but a microcontroller about the speed of the Atmega328p with at least ~20KB of code space and ~2KB of RAM is required for this. I don't know if this is realistic or not, but would it be possible to take a picture with this, identify text (i.e. from a textbook, sheet of paper, etc. ), and display that text on the calculator? I know you could probably identify the text yourself just from the picture, but I mean like storing that text to a String or something. I'm guessing you would need some more external hardware. Would this be possible? EDIT: Would it be possible to print a 3D case and insert the necessary items into it, and attach it to the calculator to take a picture? if someone does this, please post about it. Yes, 3D-printing a calculator case that has a spot to add a camera is entirely realistic. However, I won't be doing that, because I think it might make TI Education and the College Board a little too uncomfortable. Calculators will never have cameras (or QWERTY keyboards) as long as the College Board wants to prevent people from bringing the text of the SAT out of the test with them, and I don't want to make it look like TI's calculators can be easily retrofitted with cameras. Regarding your OCR (optical character recognition) question: the calculator's processor is sufficiently slow that even naive Eigencharacter recognition would be painfully slow in ASM. Slight necro-bump. Would it be possible to do the OCR on the Arduino and send the text to the calc? Either the calculator or the Arduino could do OCR (the calculator has more RAM and may have a more powerful processor, so it would make more sense to do it there to me). However, OCR would be hilariously slow and inaccurate on this sort of a platform. Note: experiment with exposure settings to figure out how to get decent pictures in outdoor light. Yes, definitely necessary. I wonder if we could come up with an automated tuning algorithm that would, instead of sending a full picture, just send the average pixel intensity. Then, iterate over the settings, fetching the average intensity each time, until it reaches ~50%. © Copyright 2000-2019 Cemetech & Christopher Mitchell :: Page Execution Time: 0.185271 seconds.